I would like to meet the couple behind Inspired Taste and hug them for all their amazing ideas. Their best idea? 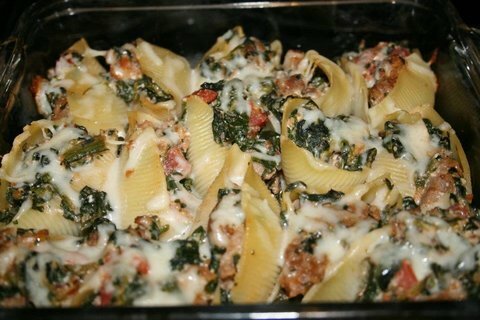 Stuffed Shells with Sausage and Spinach. It makes my mouth water just typing the name. This is literally the best tasting meal I’ve ever made. I would have eaten the whole tray of them if other people weren’t there to judge me. Yes, that good. 3. Cook shells as package directs. Then place in cold water pot. 4. Cook sausage in skillet. Break the sausage into pieces while it cooks. 5. Add garlic, tomatoes, and now-dry spinach. 7. Carefully spoon mixture into shells and place in 9 x 9 baking dish. 8. Sprinkle with cheese and bake 30 minutes. Thanks for sharing this. I made it the other night and it was delicious.